Holy Week is more than a memorial. It is a time of participation. We celebrate Holy Week as a way of participating in the great story of Jesus’ rejection, suffering, and death. We are among the crowd that cheers and waves palm branches when Jesus enters Jerusalem on a donkey. We are with Jesus when he shares his last meal with his friends. We share in their astonishment when our Lord stoops down to wash our feet and tells us to do likewise. The next day we join our voices to the crowd that cries out, “Crucify him!” And we are there when Jesus takes up the cross and lays down his life for the ones who have rejected him. The 13th-century hymn, Stabat Mater, is a powerful expression of our participation in the events of Good Friday. In the Gospel of John, we read that Jesus’ mother was standing by the cross as her son hung dying between two criminals (John 19:25-27). 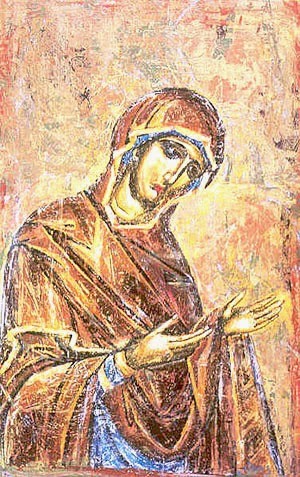 The Stabat Mater places us there with Jesus’ mother. We contemplate the cross with her. We see it through her eyes. We shed her tears. Our heart is pierced like hers. We identify with her shattering experience of grief and trust. The Stabat Mater leads us from the grief of Christ’s mother to the sufferings of Christ himself. As we stand with Mary beneath the cross, we ask that our own lives would be pierced by Christ’s wounds. The hymn invites us, like St Paul, to “bear in our bodies the death of Jesus” (2 Corinthians 4:10). It reminds us that the crucifixion is not just a mournful spectacle observed from a distance. We don’t watch the death of Christ in the same way that we watch a sad movie, shedding a few tears so that we will feel better afterwards. When we fix our eyes on the crucifixion, we are contemplating the depths of God and the hidden depths of our own lives. The cross reveals the deepest truth about ourselves. It tells us who we really are. It shows us that we are loved; that we are wanted; that our lives have already been fully judged and fully forgiven; that “neither height, nor depth, nor anything else in all creation, will be able to separate us from the love of God in Christ Jesus our Lord” (Romans 8:39). Composed in the final weeks of his life, as he lay dying from tuberculosis at the age of just 26, Giovanni Battista Pergolesi’s setting of this hymn is a profound musical exploration of human mortality, grief, solidarity, and ultimate hope. If you don't know the hymn, the words are below with their lovely melancholy Latin rhymes. You can see a performance of Pergolesi’s setting here – or better yet, come along and join us for a live performance in Sydney!